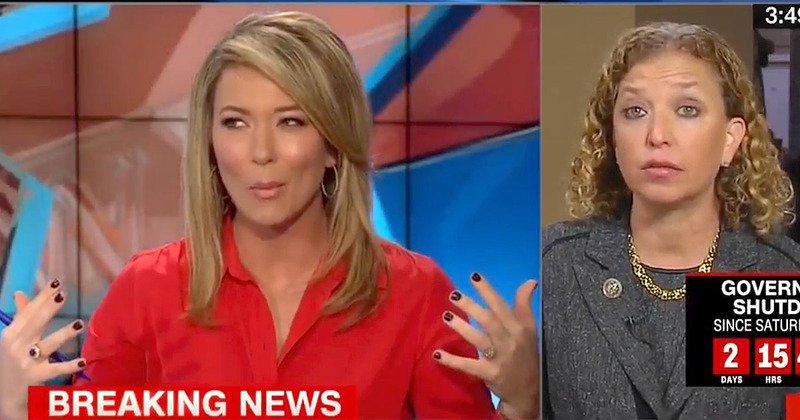 Rep Debbie Wasserman Schultz is an inviting target, even for the globalist Democrat propagandists at CNN. They brought her in to reassure their libtard audience that Democrats didn’t cave on the government shutdown and to be patient. For once she might be worth listening to. She’s got a point, one that we detailed earlier, that what was once just sitting atop the Democrat wish list, DACA squatter amnesty, is now guaranteed a week of debate in the Senate and House. That’s hardly a surrender and the despicable Schumer has demonstrated to Republicans and the nation that he doesn’t care who gets hurt in the process. Dems want their votes and RINOs want their cheap labor. American citizens are merely a complication, an afterthought for many of the sleazebags in the Senate. But the Democrats are clever, they’re spinning this “surrender” by Schumer in a couple of different ways. Some of the them, like the communist open borders hag from California, Kamala Harris, are attacking Schumer for surrendering. In doing so she is actually strengthening his negotiating position for the future as “having learned his lesson” and not being willing to “make that mistake again” in not delivering squatter amnesty. Others, like the stomach-turning Wasserman Schultz, are revealing that this was part of a larger plan. Sure, if Schumer had gotten his way he’d have taken it, but what they want as much as the votes of their newly minted Democrats is the steady supply of more invading hordes to induct into their camp. 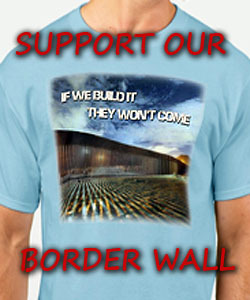 The defeat of the border wall is of much more significance and not negotiable from their perspective. Now Schumer has the debate he wanted and a solid perception of inflexibility heading into it. Wasserman Shultz can’t point to anything presently in Schumer’s possession as a result, but she makes the case that he’s set himself up to be able to get something more on the second go around, which he has already been assured will be an open debate in both chambers. She says, “The one thing I would say he did get is the potential for momentum.” Bradley goes on to dismiss the notion that “potential for momentum” is a real benefit for the Democrats. Schultz perhaps chose the wrong definition, but Schumer is a progressive and he made progress. The shutting down of the government was just theatrics, they’re the ones who plan to shut it down permanently in its current form. For them its a taste of things to come. This type of dismissal of Schumer by the mainstream propagandists has been the resounding message from all of the liberal outlets, attacking Chuck Schumer as if his last name is Trump. That alone should be enough to set off alarm bells among patriots. This seems like the type of behavior we’d be seeing if we were being set up, the reinforcing of the notion that Schumer surrendered once and can’t do it again when actually he elevated the issue and is now assured of open debate and a stronger hand. When CNN and the other mainstream propagandists are trying this hard to sell us something, we’d better be cautious. We’d best read the fine print and the warning labels. Democrats are always scheming and feigning defeat can be very disarming. The people will need to wake up and motivate their electeds. You can bet Sens. Isakson and Perdue will hear from my corner, as will Rep. Loudermilk. The people need to acknowledge the responsibility they have in this game. Else we lose. Of course, that was the only reason the D-rats gave in to another short CR .. to bring it closer to the DACA deadline so there will be no time for argument. Duh .. The establishment Pubs are happy too; they’ll get their cheap labor. I don’t think the Pubs like being “in charge;” it’s just too much work for their li’l pea brains.